COMPETITION is set to heat up between businesses to secure a place in the final of one of the North-east’s most prestigious business awards. The Grampian Awards for Business Excellence 2013 were launched at a special event at The Courtyard Restaurant in Aberdeen on Wednesday (30 January), setting the criteria for this year’s awards. Registration is now open, which allows businesses to express an interest in the competition and receive an application form. Formerly known as The Grampian Awards for Business Enterprise, the awards, which are in their 14th year, recognise and reward the hard work of entrepreneurial businesses and individuals in the region. 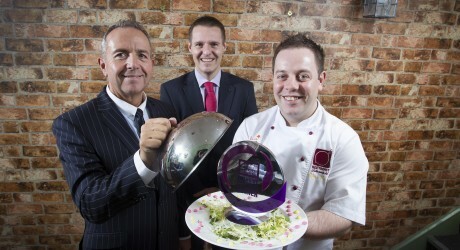 Gary McEwan, chief executive of Enterprise North East Trust (ENET), which runs the awards, and Mike Fergusson, from headline sponsors RBS, were joined at the launch by Beetroot Restaurants managing director, Chris Tonner, who won Emerging Entrepreneur in last year’s awards. Mr McEwan said: “Running a successful business isn’t entirely about turnover and profit, it is also about innovating entrepreneurship and helping the local economy grow. The Alick Buchanan-Smith Enterprising Communities Award, identifies and recognises organisations which operate for the benefit of their community and is awarded in memory of the former MP for Kincardine & Deeside, the late Alick Buchanan-Smith who was committed to enterprise and the small businesses in his local constituency. It has been another successful year in business for 2012 Emerging Entrepreneur Mr Tonner, who runs well-known Aberdeen eateries, The Courtyard and La Stella. His determination to succeed in the business world was rewarded by judges in last year’s competition. Mr Tonner added: “Winning the accolade last year meant a lot no only to me and my business, but also to my staff as they have been a great help to me and it recognised their efforts to. Awards are open to enterprises of all sizes in Aberdeen City and Shire. Registration Forms can be completed online from 1pm today at www.grampianawards.com to receive an application form and must be completed by 22 February. The deadline for applications is Friday 1 March 2013. Issued by Frasermedia Ltd on behalf of Enterprise North East Trust (ENET).